The northwestward subduction of the Izanagi Plate beneath the eastern Eurasian Plate during the Late Mesozoic caused a series of compressional deformation events in the Yanshan fold and thrust belt (YFTB), but the tectonic deformation timing, tectonic properties and relationship between tectonic uplift and sediment accumulation in the intermontane basins continue to be debated. For this reason, the sedimentology, sediment provenance, and basin structure of the Qianjiadian Basin (QJB) in the northern Beijing region during the Late Jurassic and Early Cretaceous were studied in detail. The results suggest that a fault-propagation fold-type (FPFT) growth structure and growth strata developed on the western edge of the QJB and that the top part of Member 2 and Member 3 of the Tuchengzi Formation are growth strata controlled by the limb rotation mechanism. In two small thrust faults in the QJB, the Mesoproterozoic Xiamaling Formation is thrust over the Tuchengzi Formation, and these faults may have controlled the development of the fault-bend fold-type growth strata. An analysis of the “source-to-sink” process suggests that the hanging wall succession of the Shangyi-Pingquan fault (SPF) was the main source area of the Late Jurassic to early Early Cretaceous strata in the QJB. A zircon 206Pb/238U age of 140.8±2.4 Ma for the volcanic rocks at the bottom of the FPFT growth strata represents the timing of the initiation of FPFT growth structure development. The discovery of the FPFT growth structure and growth strata in the QJB indicate that the QJB was an intermontane flexural basin controlled by fold and thrust structures during the early Early Cretaceous. 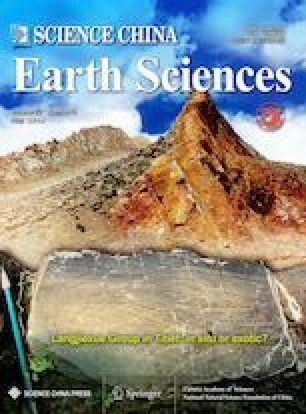 Near the E-W-trending SPF, the NE-SW-trending Qianjiadian thrust fault (QJTF) and two small intrabasinal thrust faults may constitute a unified right-lateral strike-slip system that formed in response to the northwestward flat subduction of the Izanagi Plate beneath the East Asian continent during the Jurassic-Early Cretaceous. For assistance during field work, we would like to thank the graduate students Changshun Nie, Ruiwei Li, and Lianbin Wang as well as undergraduates Hongxin Xing and Xueyan Li. For assistance with zircon U-Pb dating, we would like to thank Dr. Ping Wang of Nanjing Normal University. Finally, we would like to thank the two reviewers for their valuable advice. This work was supported by the National Key Research and Development Project (Grant No. 2017YFC0601405), the National Natural Science Foundation of China (Grant Nos. 41572189 & 41820104004) and the Strategic Priority Research Program of the Chinese Academy of Sciences (Grant No. XDB18030604).